In the following post we look at the usage of mind maps for various testing activities such as test design, test planning, session reports, requirements analysis, self organisation, and so on. Ajay Balamurugadas dropped me and Lisa Crispin a message on Twitter yesterday asking for some examples of how and where we use mind maps as this was something he was keen on experimenting with. Happy to help I responded with some example descriptions of how and where I use them. I’d like to follow up on those descriptions I gave with some real actual examples of mind maps and their usage; you can call this my mind mapping 101. 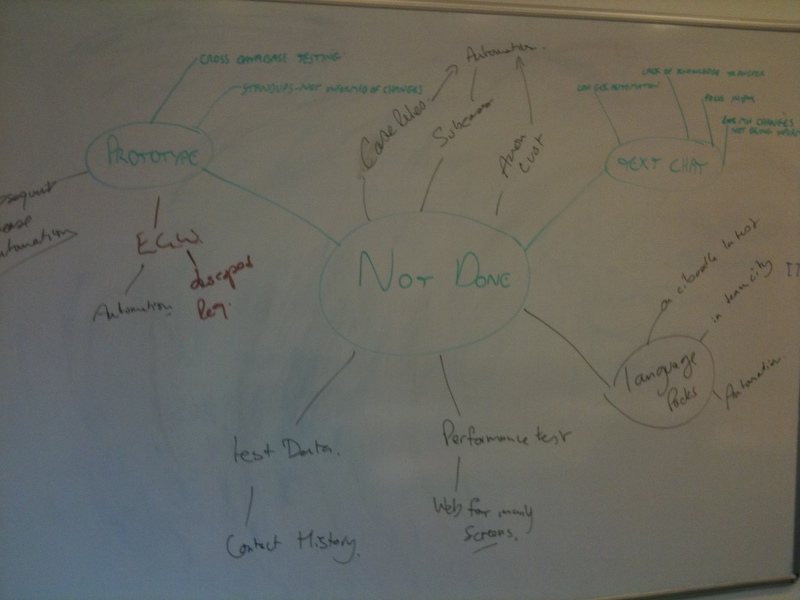 Mind maps can be fantastic tools to aid designing test cases for new or existing requirements. If done correctly you’ll be able to produce higher coverage and better test conditions. 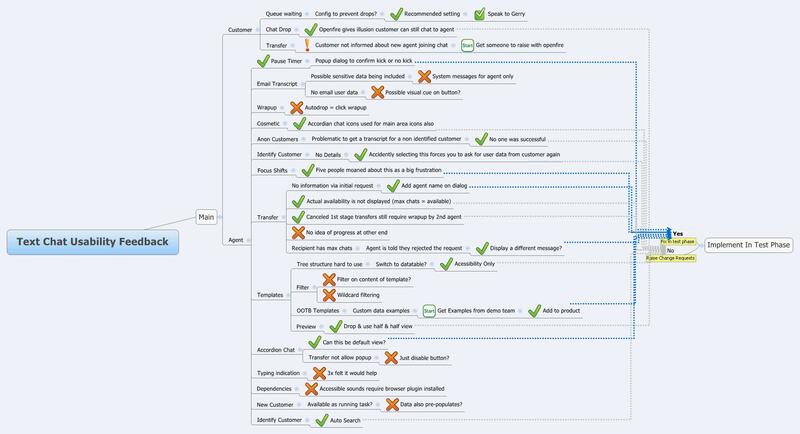 My post on lean test case design, demonstrates first hand how to produce rapid, lean, higher coverage and more efficient test cases using mind maps. When planning scope for a new project, test phase or an extensive task I find mind mapping it gives me a platform to generate ideas more efficiently. From discussing the scope of the mind map with other key stakeholders the map will quickly evolve, with new tasks being added and unneeded ones being de-scoped. Finally once the scope has been agreed the map will either stay as-is, or be converted into a plan, or list of tasks on a task management system. My post on lean test phase planning covers my approach to using mind maps when planning test phases. The mind map below demonstrates another test phase being planned with actual de-scoped tasks included for later reference. We all know the benefits of collaborating on plans, ideas, analysis and so on with others. Mind mapping is no different. In fact by discussing topics that require group thought with the aid of a whiteboard and some pens you can quickly draw up thoughts or ideas on a mind map. In fact you’ll quickly find by mind mapping it, the process of developing new thoughts or ideas will come more easily. As I don’t photograph these, I can only provide one recent example provided by my boss Michael Johnston. This map displays our attempts to draw up our testing debt going from one release to the next. Mind maps can also be useful for feeding back test results or the progress of a testing task. An example of a testing session report using a mind map is provided below, from when I attended a weekend testing session and was asked to test a text to mind map tool. You might even just want to feedback the progress of a testing task in an understandable format, without having to write extensive reports. The map below is an end of day report on a late test phase task inclusion for a telephony provider sanity check. Many often find the process of reporting information back to management types difficult. I’m no different, I spent a long time trying to find a method which worked for all. After time I found that by simplifying information feedback into a mind map with levels of importance highlighted on it I’d have much better outcomes from these meetings with management. One example was a low bandwidth test we’d done with our Indonesian based test team. I was playing the role of a call centre agent and they were acting as customers. In a 60-90 minute session we managed as a by product to get some performance and usability feedback. This was communicated to management in a quick fifteen minute meeting using the mind map below. All but one item was followed up on, which is much better results than normal. I guess because they found the information easier to digest and as a result my job of firming up why these issues should be looked was simplified. Sometimes you might have quite extensive information that you’d like to feedback to a group of people. Mind maps can be fantastic for this as they allow you to simplify that information and convey it in an understandable format that others can digest quickly. One example I can provide was from a recent usability evaluation I did. The information had to be conveyed to three different teams and management. It had to illustrate what had happened with the feedback provided from that usability evaluation in a simple understandable form. You can see from the mind map below that I did manage to achieve that and even got responses from a few people later including the product manager thanking me on the use of a mind map to convey this information. In the past I’ve used many tools to manage my schedule and tasks (my to-do list essentially). None every suited my needs fully, and required either too much time to maintain, or provided poor visibility of my scope. It dawned on me that mind maps are not only easy to maintain, but also provide high visibility. As such I converted my todo list over to a mind map, and have never looked back since. I can add, remove nodes quickly when new items come into scope or old are complete. I can also highlight and mark dates on my priorities to aid visibility. You can see my todo list in the mind map below. There are other things I use mind maps for that I don’t currently have examples of. Determining if an idea is achievable or not. Using mind maps collaboratively to design tests with others. Generating test ideas with others. Most mind maps in this document were created using the free edition of XMind. Thanks for the comment, I’m glad you find the examples useful. Weekend/weeknight testing is a prime example of when mind mapping comes in really handy. Not only does it increase your ability to generate new test ideas, it also doubles as an understandable feedback mechanism. Please do let us know how you get on with mind mapping. You can always learn new ideas from how other use them. Fantastic set of examples, Darren! I use mindmapping for brainstorming, analysis, and presentation. For the latter, expanding the standard set of icons really helps. (And importing them from a folder is just a couple of clicks in XMind). Thanks for the comment. I agree custom icons help a lot for visualising key points in the map, or process flows. Sadly XMind limits this to pro versions only. Other mind map tools such as free mind allow you to add you’re own icons without costing you anything. Darren, no reason to be sad! You can have it all in a free version as well. I’ve already mindmapped the example. See it in the upcoming blogpost (probably, tonight). Thank you very much for this blog post. I am very sure that this blog post will be very helpful for many who want to start mind mapping and use mind maps in their work. Amazing. Thanks. I will follow up on these & show you results! Thanks Ajay, but I am sure that only played a small part in it. You’re the kind of person everyone would love in their team. Well done! Great article and I love the examples you have given using xmind. I’m still getting to grips with mind mapping so it’s great to have some real life examples to latch onto. I find over time your mind mapping skills will improve and you’ll find new ways of using them to your advantage. I’d suggest trying a few mind mapping tools out first, then finding one that you like and sticking to it. Soon you’ll become accustomed to it’s functions and shortcuts allowing you to rapidly generate content on them. I’ve become so accustomed with XMind now that I’ve begun mapping up the features of new products that I test to allow me to pin-point dependencies and high risk elements to test. It adds very little effort onto my workload and allows me to generate much better test ideas. I have taken it up in initial test design, it’s great! Blogged about this internally – “Mindmap your testcase brainstorm” – thank you Darren for the inspiration. This sounds fantastic, I’m really looking forward to hearing more about it. 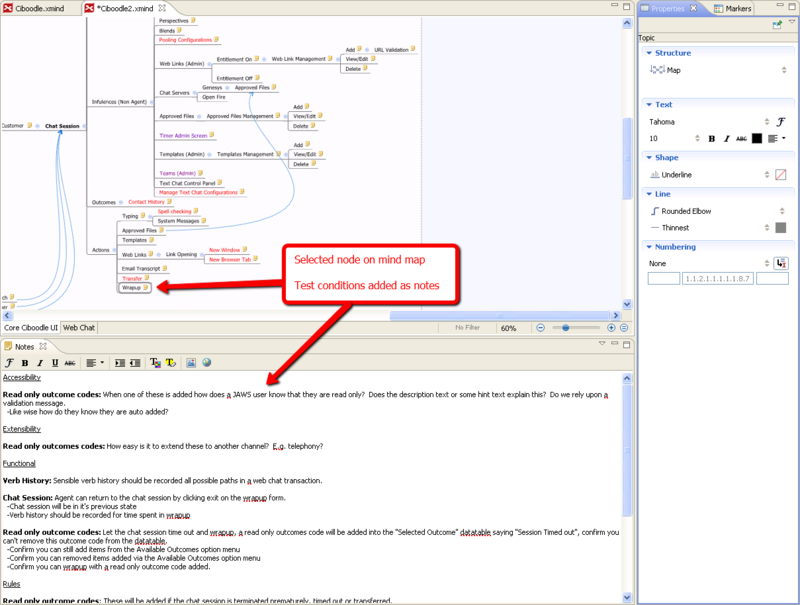 I’ve played with the idea of ditching my test management tool for mind map test cases. The test management tool provides some invaluable statistics and a nice repository view of tests that I wouldn’t get with a mind mapping tool. So for now I’ll stick with designing my lean test cases using mind maps, then porting the contents over to my test management tool. Hopefully over time mind maps will evolve to have these features, and tie more in with project planning and task management. Xmind pro is already making a very good start on this, so over time I hope that this will evolve to be a one stop, do all application that fits my needs. How does XMind compare to “FreeMind”? I’ve started using FreeMind, but do you think XMind is better? 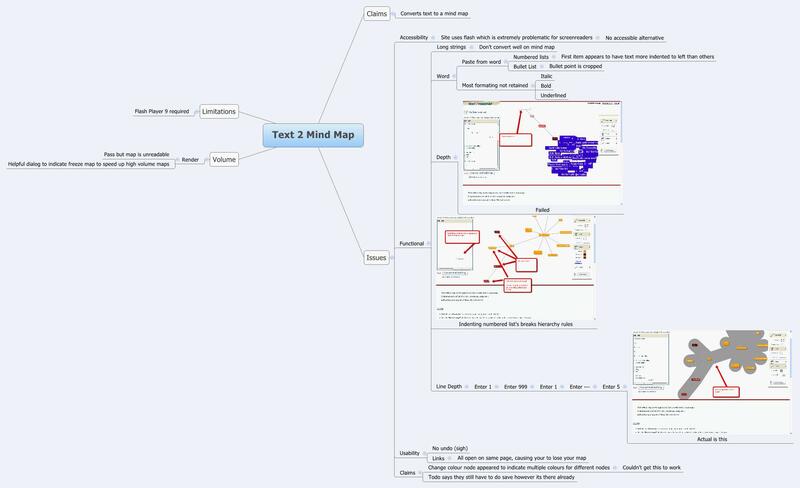 FreeMind is a pretty solid feature rich mind mapping tool. In some respects it does some things better than XMind, and vice versa. I personally feel XMind usability wise is a lot easier to use and allows highly detailed mind maps to be produced rapidly. The mind maps look more polished as well. The free edition of XMind is fantastic and feature rich. The pro version goes that little bit further with facilities for project management, collaboration, customisation and so on. If collaboration is key, try MindMeister. Which has a fantastic free edition for pair/group mind mapping. It’s a little buggy in places, nothing major though. This is exactly what I’ve been looking for. I have been digging into mind maps, and trying to figure out how to use them for testing. Thanks for the great blog post. Thanks for this great post. Mind map can help visualise new product improvement ideas or process ideas and keeps the creativity flowing. Around 2 years back I used Visual Paradigm for business analysis of an existing product which was well received by the management team. I didn’t realize why I was so much appreciated and I thought they recognized my hardwork. After reading this post, I feel that using a visual tool to present is powerful and does make a difference. Excellent comment! One of the major problems I have is providing documented content such as test plans and reports in a lean and useful format for its target audience. Not only does everyone want something different, but like you’ve highlighted visual tools which highlight textual information are generally better received. Of course this is not limited to mind mapping! Use of color in data tables, graphs, coverage maps and so on are all visual tools to feedback and reduce complexity of information which you are trying to report upon. So thanks for highlighting that. I find usage of Mindmap tools helpful in tracking the coverage. First, I would do profiling about the product and then I would use Markers to track the coverage. Depending on it, I know that — At what stage of testing am I and do I need to re-strategies the approach or I am good with the current one. I also used it to document the bug reports under different categories after I am done with profiling of a product. Thanks for the comment. I’ve played about with using mind maps for coverage in the past, and have found them useful for this. If it’s a feature, then I can map out different aspects of that quickly, and use like you said markers to highlight different things. For product coverage I always find myself reverting back to spreadsheets, as it can be quite hard to map out an entire products coverage depending upon the size of the product. I do have an idea though to make mind maps more useful for product coverage, and this is something I’m going to explore as our team grows in my new position at MaidSafe. I’ll blog about that after I’ve experimented with it. I’m already using the same technique for a holistic approach to product testing using mind maps (blog post pending). I would love to see some examples of your coverage maps if you are allowed to share their content online. I might be able to learn a trick or two from them. 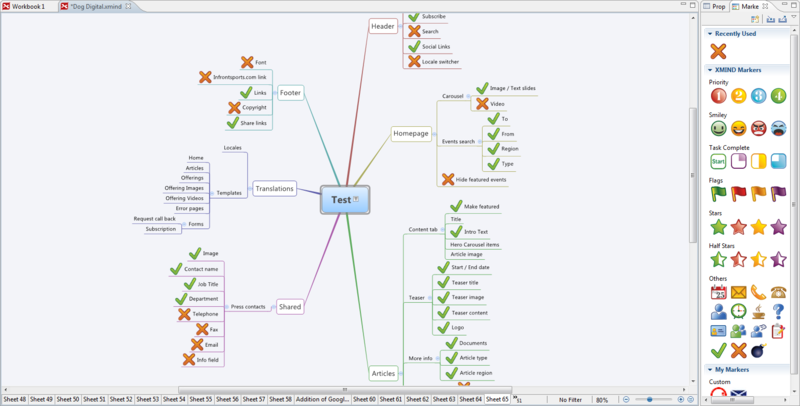 I will create status testing report for my project using MindMap. Because of this post. Thanks, I’m glad you found it useful. I hope you’ll show some examples of the mind maps you create on your blog? Fantastic post Darren. Mind mapping can be an incredibly powerful tool for ensuring good coverage when identifying test conditions and writing test cases. Great blog too, btw – added to my RSS collection! Thanks for the nice words. 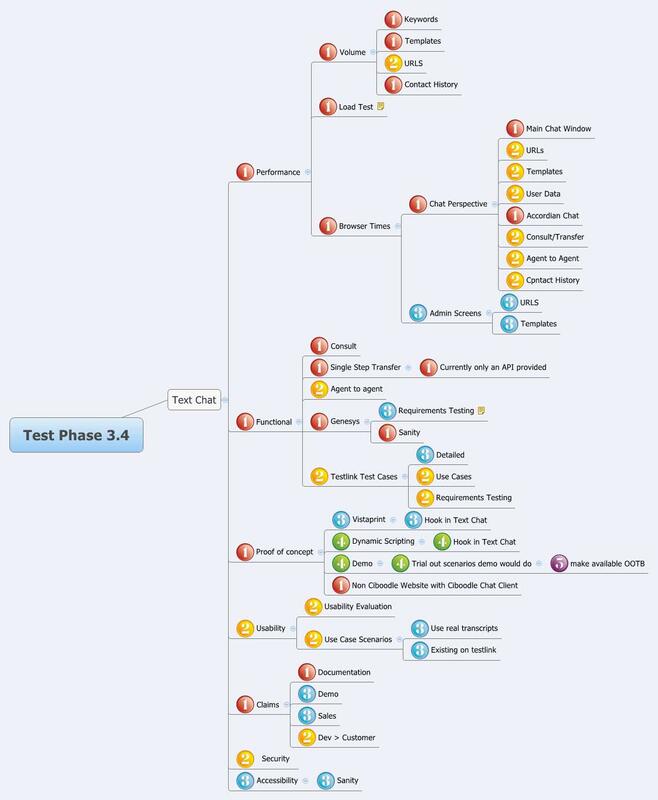 I have in the pipeline a post on mind map options for test design. Hopefully I’ll get the chance to write that soon, but if you enjoy using them to write test conditions and ideas, then you’ll like this. I have also experienced the usefulness of mindmaps for recording minutes of meetings concisely. They are especially useful with mixed nationality teams where English is a second language making comprehensive minutes difficult to produce and limiting their usefulness. I’m currently using mind maps to help a GCSE classes both order new information and revise efficiently. They work across all ability groups and are quickly understood. This post shares more functions and I thank you for it. For personal use one function I would appreciate it the ability to send nodes to my phone as calender items. Do you know of software that does that? Thanks for the comment and very interesting insights into other uses for mind mapping. Like your use for meeting minutes I use them for taking notes on talks and training material and find the ability to rapidly take useful notes very inspiring, making me want to digest more and more. It really is fantastic dealing in visuals when you try to go over at a later date what you have recorded in your map. Recalling items from it is so much easier this way I find, than it would be in a traditional note format. Highlighting on using mind maps for communicating across language barriers is fantastic! As for a tool which can notify your phone from a map. Sadly I’ve not seen anything like this. XMind does provide task management capabilities in the Pro version, but it is very limited and doesn’t provide any notifications like you’d asked about. This could be a good feature request to put forward to them though. Would be fantastic to see some examples of your mind maps at some point Ric. Stumbled across this piece today, really great stuff! Thought it would be worth letting you know that you can now add XMind maps to the mind map library at http://www.biggerplate.com, and it would be great to see any maps you have! Our site is totally free to use and we are always on the look out for people who can share their maps with our community – I hope you might join us! I have seen your site before and had meant to at some point upload the maps that I could there. I will take the time out to do that as soon as I have enough free time to look over them all. Fantastic idea with BiggerPlate, it’s nice to see knowledge repositories like this, which can help others. It’s great that you are already aware of us, and thank you for your kind words about the site! We would really love to see any maps that you can add, and it can be a great way to tell other people about your site too! We are aiming to reach 2,000 maps this year and are just 100 away from our target – any maps you can share would be a great help!!! I will certainly try and help you achieve that before the end of the year. Have you ever thought about included reference material, for example via a knowledge link or something more apporopriatly named on your main pages navigation bar? Within this you could build up an article collection which would help people improve their mind mapping skills. If anything, it’s only another reason for them to come back to your site. Any maps would be great, we are now less than 100 maps away so we are slowly but surely getting there! Your suggestion for reference material is a very good one. We are currently looking into the creation of a “learning” section on the site that would contain lots of stuff to help people who are completely new to mapping, as well as experienced users who are looking to build upon their skills. It’s likely to contain video tutorials created by others, in addition to articles etc too. We think (as you suggest) that this would be a good way for Biggerplate to act as a source of learning, and we are very keen to develop this idea to compliment the training services we provide and will be promoting more extensively next year. All in all, lots to do, but plenty of enthusiasm to do it! Ideas and feedback always greatly appreciated! Thank you, I never thought of using mind maps fir my to do lists. Perfect idea, can use my iPad and keep my list close to me at all time, quick notes, no turning pages, dynamically moving tasks around, love it. Thanks Florin. I have never done mind mapping on a tablet PC before, I can only assume it must be really interesting to do, what with all the nice touch screen affordance options it must have. I’ve been using FreeMind for the last few years, initially for brainstorming test ideas but in the last two years I’ve been using it for test management of Exploratory Testing. Inevitably I get asked by Test Management and Project Management to pull total, pass, fail, no-run metrics. Initially, I sent a pdf of the mind map and let them figure it out for themselves but after numerous questions like “What the hell does smiley face mean?” I had to provide some metrics. I am tempted to upskill and develop a tester plugin for FreeMind or XMind or an integration with one of the common Test Management tools but that’s a pipe dream for now. Very interesting a novel idea of pulling metrics out of a mindmap. I do scope maps, which give a similar pass/fail/blocked overview of project requirements. I have yet to pull any metrics from it, mostly because my scope maps are final sanity checks to make sure that I have covered all my test basis, but also because any issues found then get logged into our bug tracking system or on an agile project board, so pulling them from the mind map might not cover all of issues found during a project. The plugin sounds like a good idea that people could make use of to count the various icons they add in maps to track various aspects. I’ll pull an example out of a scope map to show you later. I suspect it will be very similar to your maps. Love the concept of mindmaps for planning purposes. Trying to figure out how to merge this w/ the 5 minutes test plan from James W.
Talking people through a mind map plan is much easier than doing so via a document or spreadsheet. Likewise, simply giving someone the mind map plan (if done well) is usually enough to provide them with enough understanding of your plan, simply from looking at it. I’ve been thinking about using Mind Maps for a little while now but haven’t yet started to use them, the real world examples above has inspired me further and I think they would be really useful in one particular area. Test Phase reviews are a burden and most people hate them not just QA so I’ve been thinking of a way to make them less monotonous and more collaborative and speedy to achieve the same goal. Using Mind Maps for these sessions seems to be a good place to start rather than going through a long list of test cases, now I have a real reason to start rather than thinking about it and doing nothing with it. Stephen, they’re great for this, please do let me know how you get on. Perhaps you’ll blog about it also? Thanks for the comment & for sharing such a wonderfully written post. I have read this article, Darren. It is excellent. I can use my Iphone to make tips. I like your examples, because you used real examples and shown us how they are used. It is great advices and for my life I really going to use your tips. Thank you a lot. I will try and i extremely admire this article. I look for a lot of information about this topic. Maybe it would be for somebody useful. It is a great article about best mind mapping software that helps me to organize thoughts or study materials in a way that is more comprehensible. In my opinion only self-organization can help people not to be lazy. One of the best blog on Mind Mapping I have ever seen to start with Mind mapping. I am planning to introduce the Mind Mapping to my team. Hope People will understand and take it further. Thanks a lot for posting such a nice post on this blog. I am relatively new to testing and we are currently introducing mind maps. My question is how do you know you have covered all areas? How are you able to track what ya have tested and what is left to do? It seems a little foreign to me at the moment but I like to think I am making progress. Any extra tips or pointers would be great. Sorry for the late reply, I haven’t had time to keep up with this blog lately. Good question, I’d planned on doing a post on this a long time ago, just never got round to it. A tick for something which worked successfully, and a cross for something which failed. You can add progress indicators for something partially tested, and something you haven’t looked at yet I just generally leave blank, so I can quickly identify that I’ve still to test this. I’ll try find time to finish off my mapping posts, I’ve still got some pretty cool stuff to share that I use them for. I recently downloaded the free version of xmind. I have not used this tool before. I plan to use it to prepare Test Strategy for testing defect fixes. If you could provide me some samples of test strategies in such situations using xmind that will help me a great deal. Thanks Darren, I came upon this article and found it extremely useful. I’m currently working on implementing this in the team as well. You can find some good mind map examples in creately diagram community. There are 1000s of templates and examples in the community to be used freely. Testing in Hell: Why not to “agile” everything or "always think before do anything"
Thinker Tester: How mind maps are useful in testing? Enjoy testing: Mind maps at STeP-IN Summit 2013. See you there.